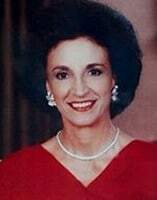 Selwa “Lucky” Roosevelt is best known for her role as Chief of Protocol of the United States from 1982 to 1989. After graduating from Vassar College in New York, Lucky pursued a career in journalism, covering social events in Washington D.C. She was invited to take the position of Chief of Protocol by Nancy Reagan and Mike Deaver after showcasing her talent as a reporter. 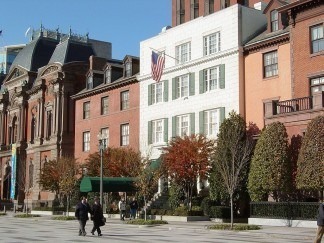 As Chief of Protocol, Lucky organized over 1,000 visits of world leaders to the United States and directed the restoration of Blair House, the President’s guest house. Selwa Roosevelt was interviewed by Charles Stuart Kennedy in November of 2003. She talked about growing up in Tennessee as a daughter of Lebanese Druze immigrants and the start of her long career in journalism. She also described her career as Chief of Protocol at the State Department, the challenges of organizing state events with conflicting personalities and cultures, and how being the wife of career CIA officer Archibald Roosevelt changed her life in ways she never predicted. To read more about the Reagans, protocol or espionage, please follow the links. Read the whole oral history of Selwa Roosevelt. I was born in Kingsport, Tennessee. I am the daughter of Lebanese immigrants. My parents weren’t very well off in this country. My mother came from a very good family, and they were far better off there, but she had married against her parents’ wishes to my father who had sort of spirited her away. We grew up in Tennessee and in a wonderful environment which was very middle class…. My mother was very cultivated and she surrounded us with books and made sure that we were given every kind of lesson which she worked hard to pay for. We had art lessons, we had music lessons, and we had what they used to call down home “expression lessons” which were learning how to give a speech. It’s amazing what this woman did. [My family name] was Choucaire. That wasn’t what we used. My father anglicized it to Showker. My parents were from the Druze — the tribes that were really sort of an aristocracy of Lebanon at one time. They held the balance of power between the Christians and Moslems and the Druze are very special. They have a great history, they think, and they are proud people like mountain people everywhere. My family’s village is a place called Arsoun, and the only other prominent person that you’ve heard of who came from there is Ralph Nader. Ralph’s family was Greek Orthodox. It was a village of Druze and Greek Orthodox who lived very happily together…. I didn’t feel foreign. I felt foreign in my looks because I’m dark and have a definite Middle Eastern look. But I never felt in my soul that I was any different. I loved America and being American, and when we came back from Lebanon, I remember my mother was pleased that we had learned to speak Arabic during our two years there. But the minute we got back here, I didn’t speak Arabic; I didn’t want to hear it. I rejected all that because I wanted to be American, so American. So that’s what happened, and I don’t speak Arabic to this day. I got the name “Lucky” at Vassar College and that was playing cards. I was a bridge player and a poker player; I liked both. They thought that I was very lucky; and I think I was…. I worked every summer and that’s how I paid my way through college. I was a journalist. I started out as a newspaper reporter. In my high school summers, of course, I was much too young to be doing that. My father was very against that. He thought that I would get into bad company, and he was quite right and I did. That’s how I learned about the world. It was The Kingsport Times, a very good paper. I had wonderful editors. I wrote features mostly although I started out doing obituaries. They always make you do obituaries. Then after that I had to learn social copy, how to report tea parties and things. In those days, weddings were a big, big deal and you described the bride’s dress and all of that. I learned all of that, never knowing, of course, that one day I would be involved in the world of protocol. Well, I graduated with honors, and I wanted to be in the State Department or something like that. I didn’t quite know; I was pretty unsophisticated about Washington. I talked to this lovely man who interviewed me for the State Department during my senior year at Vassar. I think he gave me a list of five people that he wanted me to make appointments with and be interviewed by. The last name on the list was Archie Roosevelt (seen right). Well, I started with him. That seemed more interesting. I went thinking that I was being interviewed for the Voice of America and, apparently, I was also being interviewed for the CIA. I didn’t know that…. So I went strutting down from Vassar in my little red suit and black hat and gloves, the works. And I guess I looked pretty good then. He apparently took one look at me and it was love at first sight. It was one of those strange things. I said what do you mean? He said, “well, I figured out you must be Druze because of the shape of your head.” He was an anthropological expert. I said why, what’s there about the shape of my head? He said, well, you have a dolichocephalic head and you know the Christians all have very flat heads and you didn’t look like a Moslem, and I just thought your family must be Druze. That really intrigued me. So then we had lunch. 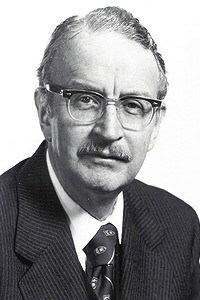 Archie was a very cute and funny man. He had a huge sense of humor and was a very amusing conversationalist. But he wasn’t a flirt in any way. Later I found it was totally unheard of for him to ask a person who came to his office for lunch. I had a date with somebody else that night so I went out with my boyfriend. 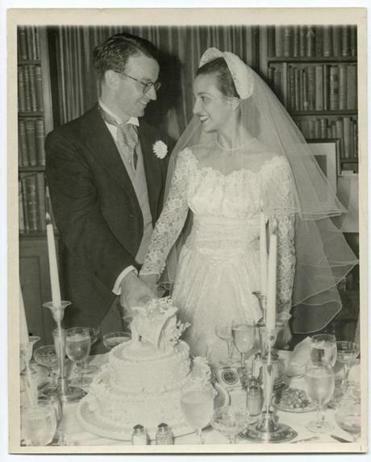 The next day, Archie insisted on driving me back to Vassar and we spent the day together and he said to me at the end of the day, “You know, we’re going to get married.” And I said, “Yes, I think I do know that.” And we did. We got married three months later. It was love at first sight for both of us…. I started my career as a journalist. I wrote a column for four years in Washington, for the Washington Star. This is what prepared me later for my job as Chief of Protocol because I covered the White House, the State Department and the diplomatic corps. These were my sources. I covered events, State dinners, State functions, inaugurations, diplomatic events, etc. That’s how I learned what I later brought to my job in the State Department. I didn’t know at the time I was preparing so well…. And I remember it was Jackie Kennedy (seen right) who really helped me because everyone tried to get an interview with Jackie – she had just married Jack [President John F. Kennedy] – but she gave me her first interview. I was in Brazil doing a story for Town and Country when I got a call from Mike Deaver who wanted to know if I wanted to be Chief of Protocol. I had never asked for the job; I had never asked for any job. In the social swim, so to speak, I had invited Nancy Reagan to lunch when she came to Washington. I had met her by that time, several times, and also they had invited Archie and me to the White House for the state dinner for the King of Jordan and Queen Noor. I guess Nancy had observed me and thought maybe I would be a good Chief of Protocol when Lee Annenberg resigned. When [she did resign] Nancy and everybody looked around to see who would be the new Chief of Protocol, even though the Chief of Protocol does not work for Mrs. Reagan; she works for the President and the Secretary of State. Still, Mrs. Reagan, I am sure, was responsible for the fact that I was invited to take this job; Mrs. Reagan and Mike Deaver combined. Mrs. Reagan, in my opinion, was an excellent First Lady. She performed the job really well. She brought a lot of excitement to the White House and to the social life of the city. You know, people really looked forward to coming to Washington. In the seven years I was Chief of Protocol, we did ten state visits every year. In the first place, it’s a good way to take care of people who have been good to the Administration, you know, your big donors. You invite two of those and then invite all the other people you need to invite. It serves a lot of purposes. But state dinners I found a wonderful tool, a very important tool, in statecraft. Ronald Reagan and George Shultz knew how to use them. George Shultz was a very good Secretary of State, particularly in the way he interacted with the Department and the people in the Department. Also, he really liked to have a good time. He looked so dour, but he was so much fun and he loved a good party. He said right from the beginning, “Lucky, we’re the most important nation in the world and we’re going to go first class.” I was allowed to use my imagination and do things with style. When he was Secretary of State there were little things that he wanted. When we were having dinners in the Ben Franklin Room we used a program cover with Ben Franklin on it. And when we were having dinners or events in the Thomas Jefferson Room we used something with Jefferson. We were able to produce really beautiful things like that for him and he loved that. 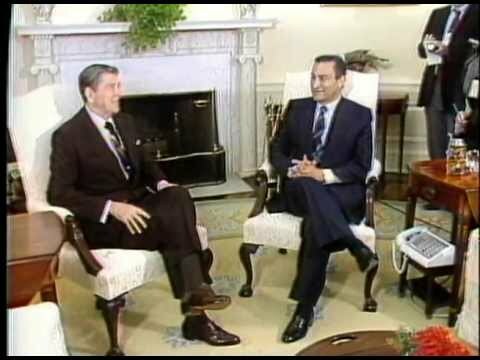 I remember one time when [then President of Egypt Hosni] Mubarak (seen left with President Reagan) was coming and we always had to be very careful that we did the same thing for Egypt that we did for Israel. Mubarak was coming for a working visit, not a state visit, but still we always entertained. In those days with working visits we gave them the works also. We had a real problem because suddenly one of the Russian Premiers died. The Vice President who was giving the dinner for Mubarak had to go to the funeral; and Shultz decided to go to the funeral and so we had nobody to entertain Mubarak. So he was going to call the visit off and it was very important for some reason. Shultz liked that idea and presented it to the president. The president said, “Sure. I’m not doing anything that night.” He wasn’t going to the funeral; he was the only one who wasn’t. So sure enough, the President came over to the State Department and Mubarak was just thrilled. 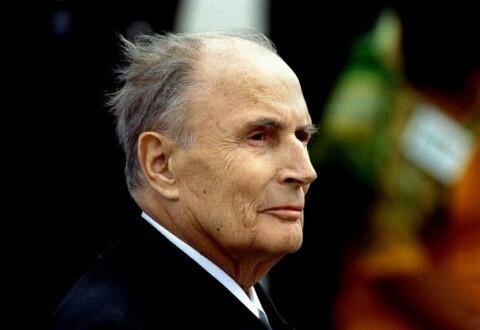 This just made his day and you can imagine how that played in Egypt.. ..
One thing I will never forget; we went to France for the G-7, the economic summit, and naturally we were the guests of Mitterrand (seen right). And Mitterrand gave a dinner for the President, and the President had to give a dinner for him and so I was involved in all that. But when the President was going to see Mitterrand, he was twenty minutes late because he stopped to see the widow of an American Embassy official who had been shot and killed. He just felt he had to do it; the President was very compassionate. Mitterrand took that very badly even though he was warned and advised that the President was going to be late because of this. We thought he would make an allowance for it. Not at all. He was quite annoyed. Sure enough, exactly twenty minutes later he arrived. Everybody was furious, Deaver and all. I said, “Relax. This is diplomatic language.” The best thing to do was ignore it, I thought. They wanted to make a big deal of it…. I had a few run-ins with the White House advance team. One time they said they wanted to take over the planning of the visit of the President to the United Nations. I said, “Well, all right but that’s not your thing. Maybe you should think about it.” No, we want to handle that. You know how these people are in the White House. They run all over you. I just decided I wasn’t going to fight with them about this. But I still had to be in New York to keep an eye on things. As lunch was being given for the King of Morocco (seen left), I went in just to look over the table at the Waldorf in the President’s suite. The table was set for about twenty people. The first course was on the table which was prosciutto, which is pork, and melon. I almost had a fit. I raised hell with them, and I reported this back to Shultz. After that, somehow or other, they decided maybe Protocol ought to do the entertaining after all. We got through that little attempt to stake out new territory. 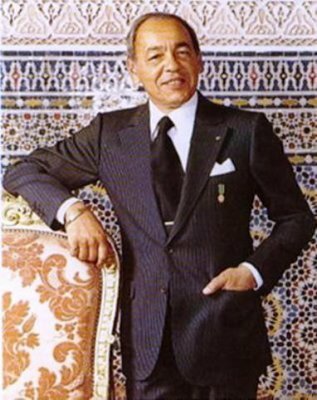 The King of Morocco was like a medieval King. He was wonderful in a way. He tried to give me the most magnificent gifts, none of which I could accept, jewelry and all that. He was very kind to me. But their idea of being on time – hopeless. They would be 45 minutes late for the First Lady. Well, the Chief of Protocol was trembling and he reported this to the King and the King accepted it. He never gave me a hard time about it. I did that without telling Mrs. Reagan. I just thought it was insulting to keep Mrs. Reagan waiting an hour. So the next day, he sent her about $2,000 worth of flowers. And the next time he came he wanted to see her, and he was on time…. One of the things I should really talk to you about that I’m proudest of is the restoration of Blair House, which was really my biggest accomplishment. It took me six years. I became Chief of Protocol in 1982, and we started the preliminaries in the spring of 1982. We shut the house. We opened it again with the President coming over to cut the ribbon in 1988. So it took six years to restore. I think that’s probably the best thing I did in the seven plus years I was Chief of Protocol. I was fortunate in that both the President and Mrs. Reagan and Mr. Shultz wanted to see really dramatic changes at Blair House. The place had fallen into bad disrepair. As Mrs. Reagan said, it was a disgrace to our country. I couldn’t believe how bad it had gotten just everywhere, even the kitchens. It did have four basements that were separated; they were not integrated. Just to give you an example of the sweeping nature of what we did, we gutted all of the basements – that was quite a job – and made it one huge working space, kitchen, staff rooms, a cold pantry, a place for the pastry. It was turned into a modern commercial kitchen. Then the houses didn’t flow, one into the other. A wall had been cut and a door had been put, but sometimes a visitor would have to go up the stairs and then down some stairs to get to the next house. Originally Mr. Blair built the oldest house for his residence. When his daughter got married he built next door and was called the Blair Lee. That one we just cut a door, sort of. Actually later we really did a lot of changes to make a smooth connection. When the two houses next to Blair House were bought in the sixties by the government – the original Blair House and the Blair Lee House were bought in the forties – and what we did was really integrate those into the House. Before they had just been separate houses; there was access but it was miserable looking. What we did was make this into one rather grand but not pretentious guest house. The house was gutted. We had to get new electricity, redo the plumbing, all those basic things you never see. The decorating was the big thing. We hired two of the greatest decorators in America – Mario Buatta and Mark Hampton…We added an entire wing on the back of Blair House for the heads of state with a small ballroom on the first floor. It is used for all the dinners, and entertaining. Of course, there are three dining rooms available to visitors as well and quite a lot of sitting rooms. And then there was a hideous room that before we called the press room. There was nothing in it except the most atrocious wine-colored rug you ever saw. The walls were dirty and ugly and that was where the press could come in and do interviews and set up their equipment. Well, we changed that. It is so beautiful, that room now, it’s the biggest room in the house. We painted it and papered it; we put a brocade type of paper – red. It has the biggest dining table, but it’s also used as a meeting table. We sign treaties on that table now. When the President wants to do something like that he comes to Blair House not to the White House. Several big and historic events have taken place there in that room which before was just lost space. I raised $5 million in cash and about two more million in gifts in kind. There was a different kind of battle. I had to go to the Senate to get the appropriations that we needed for the bricks and mortar. I raised the money for the decorating, but the bricks and mortar was going to cost around 10 million because of adding this secure wing. It all had to do with security. And I said, “Over my dead body.” We laughed a bit about that. Then he said, “I’m not going to approve anything like this.” He was chairman of the committee. I knew what that meant. He was going to change his mind, but he was pretending he would talk to his staff.